The 29th Infantry Division first saw combat in France during World War I. During the final months of the war, it was part of the Meuse-Argonne Offensive, during which it advanced through heavily defended German lines and knocked out hundreds of artillery pieces and machine guns. It next fought during World War II, again in France. As part of Operation Overlord it landed at Omaha Beach, but most of its landing craft were blown off course during the landings because of rough seas and weather. After taking Omaha Beach, the division fought through heavy German defenses in the Normandy hedgerows, and eventually liberated St. Lo despite house-to-house fighting and heavy German artillery fire. The division then fought through Brest and eventually into Germany. 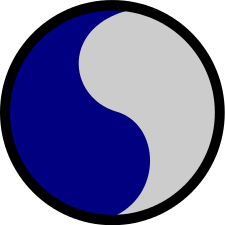 The division then served occupation duty until 1946. The division was deactivated during the Vietnam War because the Army was trying to shift resources away from National Guard divisions, such as the 29th. It was reactivated in 1984 as a light infantry division. The division saw its first combat since World War II in Afghanistan as part of Operation Enduring Freedom. It helped provide security for Bagram Air Base and for elections in other provinces, along with patrols to find and destroy the Taliban. The division has also fought in Iraq and acted as a peacekeeping force in Bosnia.